A couple of years ago, I woke up to my roommate letting me know she was getting married. Cue instant excitement and a million questions. One of those questions was when is this going down? With a smug grin, she was like, TOMORROW. Was she stressed? A little. But the things she was stressing about weren’t about centerpieces, decor, or even seating arrangements. She was just anxious to get married, and the last thing on her mind was the venue. They knew that getting married at San Francisco City Hall, which was A) sentimental, since they are both born and raised in San Francisco, and B) convenient (and mostly stress-free) because there have been so many weddings there, that the City of San Francisco has this thing running like a well oiled machine. 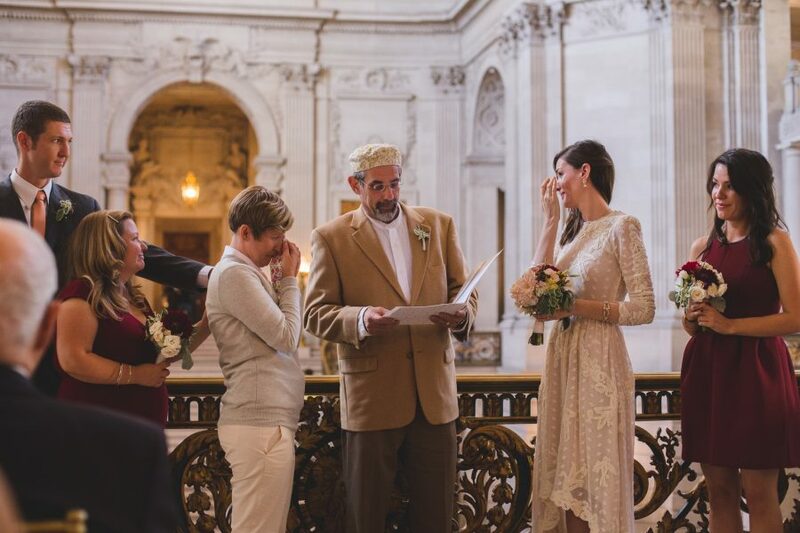 Having grown up in the Bay Area my whole life, I’ve been to a few weddings and events at San Francisco City Hall, and they are always so memorable. The building itself is so simply stunning and has great lighting, so you don’t need much decor, or any at all, to elevate the beauty that is San Francisco City Hall. Plus, the gay marriage movement in the United States has its roots in that building, so it is full of the power of good. So, if you’ve picked San Francisco City Hall as your venue, you’ve picked a good one. Now how do you start planning for this wedding… that is possibly taking place tomorrow? Well, we talked to Photographer Emily Gutman of Emily Takes Photos (who offers a one-stop-shop City Hall wedding package) along with the nice folks at City Hall. With all that information, we pulled together what you need to know to get started. Or you know, planned in a day. How much does it cost to get married at San Francisco City Hall? The marriage license itself is $104, and the civil ceremony is $83. There are also options to rent spaces for more private weddings on either the fourth floor or the Mayor’s Balcony, starting at $1,000; visit or call the Events Office at City Hall for more info (room 495, 415-554-6086) or at sfcityhallevents.org/weddings. What kind of reservations or appointments do I need to make? You’ll need to make two appointments: one to get your marriage license and one for the ceremony. You can get your license before the ceremony date, which is recommended for private ceremonies, but not necessary for civil ceremonies. If you get your marriage license the same day as your ceremony, we recommend setting that appointment an hour before the ceremony time. Reservations can be made up to ninety days in advance, so if you want to get married on a popular date or time (Friday afternoons are the busiest for weddings), make sure you book your appointments as soon as you can. How do we get a marriage license? To get a marriage license in California, you must be eighteen years old, but you do not have to be a California or United States resident or citizen (yay for international elopements!). Both parties must be present and have unexpired government identification. Once you’ve made your appointment for your marriage license, you’ll submit your application to the County Clerk’s office (room 168) on the first floor. Be sure to check the County Clerk website at sfgov.org/countyclerk/MARRIAGE for complete requirements. You can obtain your marriage license from any California County. California Marriage Licenses are valid for ninety days. Do we need to bring witnesses? You only need one witness, and you can have two sign your marriage license. Your photographer can absolutely sign as your witness. Bring your witness(es) with you to your ceremony appointment. Where will the ceremony be? Most civil ceremonies will be in the Rotunda, on the second floor at the top of the grand staircase. During slower times, couples have asked to have their ceremonies held up on the fourth floor or in other spots around the building. It’s up to the judge who will be marrying you (you’ll meet them when you get your marriage license), but if it’s a slow day and there aren’t any ceremonies immediately before or after yours, it’s worth a shot to ask them. There are a number of deputy marriage commissioners who rotate performing civil ceremonies. We’ve been told by a couple of judges that after days of hearing depressing court cases, performing marriage ceremonies is one of the best parts of their jobs. If you’re having a private ceremony, City Hall recommends that you use your own officiant. Is there a time limit for our ceremony? Civil ceremonies are limited to ten-minute time slots, as there may be more couples getting married either immediately before or after you. We generally suggest taking any formal or family photos away from the ceremony spot so that everything moves quickly and efficiently. Rented spaces are available by the hour. How many guests can we bring? For civil ceremonies, you’re allowed six guests. However, it is a public space, so anyone can be there (which means ceremonies may be less private than you like). Private ceremonies on the fourth floor and Mayor’s Balcony can hold up to one hundred guests. Is there parking nearby or public transit to San Francisco City Hall? Yes! There is a parking garage underneath the Civic Center Plaza; the entrance is on McAllister Street, between Polk (also called Dr. Carlton B. Goodlett Place on that block) and Larkin. City Hall is also close to the Civic Center station, where both BART and Muni stop. What is the best day and time to get married there? Civil ceremony reservations are available Monday through Friday between 9:00 a.m. and 3:30 p.m. The best time depends on what kind of vibe you want. Mondays through Wednesdays, especially in the mornings, are really quiet and a slower time for ceremonies, which means you may have your pick of ceremony location, and you probably won’t have as many people in the building to work around. Fridays, especially in the afternoon, are generally a very busy time for weddings, but there’s something really fun and unique about this experience; everyone is excited, the building is filled with love, and if you like watching awards shows for the dresses, Fridays at City Hall will definitely be your thing! Do you have any other advice for couples getting married at City Hall? Gwen: At City Hall you need time for the security line, time to get a lay of the land, time to gawk at the building, time to figure out where the balcony in question is, etc. Had we breezed through the office formalities and gone right up to our ceremony spot, my mother would have missed the ceremony. Basically, just make sure to let guests know that they should build in some buffer time. Samantha: My advice for the weekday private ceremony: Don’t bring too much stuff. You only have the space for an hour and there isn’t a garbage can. Gina: I was so stressed out about not being able to get our license for some reason: What if we forgot something important? What if they deny us for some reason? If for some reason we were denied our license, it would have ruined our already-planned-out day. I think if I could do it again, I’d have us get our marriage license beforehand so I wouldn’t have to worry about it the morning of. Also, if a couple is planning on having a lunch or dinner right after their City Hall ceremony, I would absolutely recommend choosing a place within walking distance of City Hall (I would totally recommend Absinthe for a reception). It just made things so much easier for us and our guests, especially in a city where parking can be difficult! If you’ve gotten married at San Francisco City Hall (or any City Hall for that matter), please share your best tips and tricks in the comments! Chelsea has been working in events for four years doing corporate event and party planning and wedding floral design. She has worked for A Practical Wedding for two years, becoming an expert on not-so-corporate events, styled shoots, social media management and wedding planning.